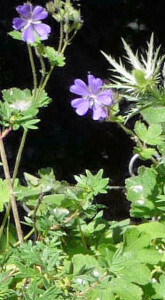 The felty leaves of this elegant Cranesbill have the appearance, if not the aroma and flavour, of Sage. Geranium Philippe Vapelle’s soft, blue-green foliage makes a low mound from which the flowers, a delicate LAVENDER BLUE with dark veins, rise in June. Like our other Hardy Geraniums, this deciduous hybrid from Belgium has proved trouble-free. 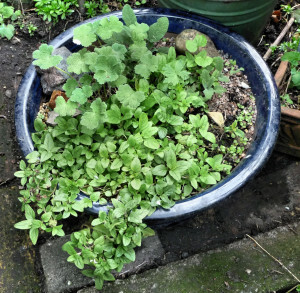 It has suffered with no pests or diseases, coming back year after year in its partly sunny position, growing in soil that is moist but well-drained. When its foliage and flowers are spent, they are trimmed back. Before long, fresh evergreen growth rises at the base of the plant, growth which usually lasts through the winter. 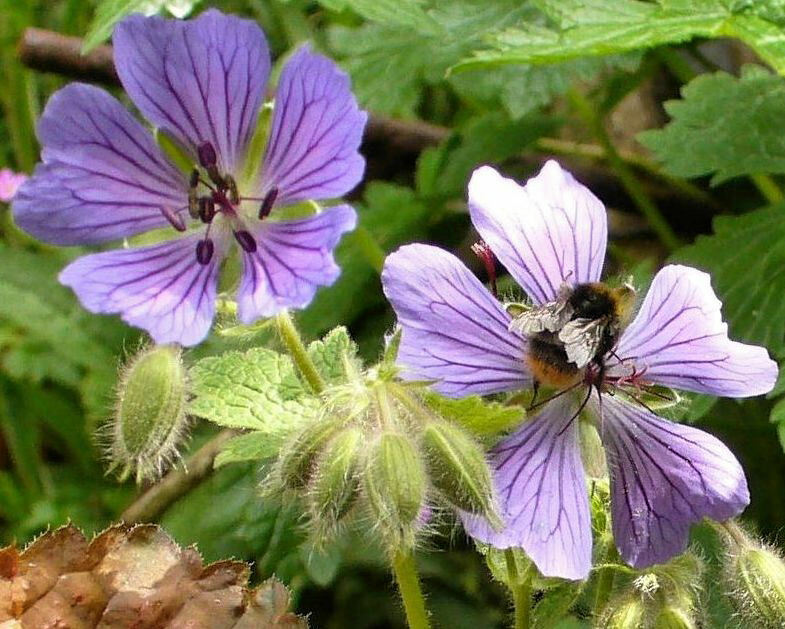 Throughout its all too brief flowering time (usually only a few months here in London), Geranium ‘Philippe Vapelle’ is sought out and visited by attentive pollinators, especially bumblebees. RF the gardener may have brought this one back from the Colombia Road Sunday Market. For years its name was unknown to us, and we referred to it by the shape of its leaf: the Kidney Geranium. 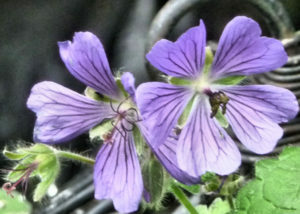 In answer to a request for ‘blue Geraniums’, the internet has now provided its name. Green scalloped leaves topped by gappy violet-blue flowers. The soft foliage is very pretty so the fact that it flowers once shouldn’t put you off (15 ins/35cm). 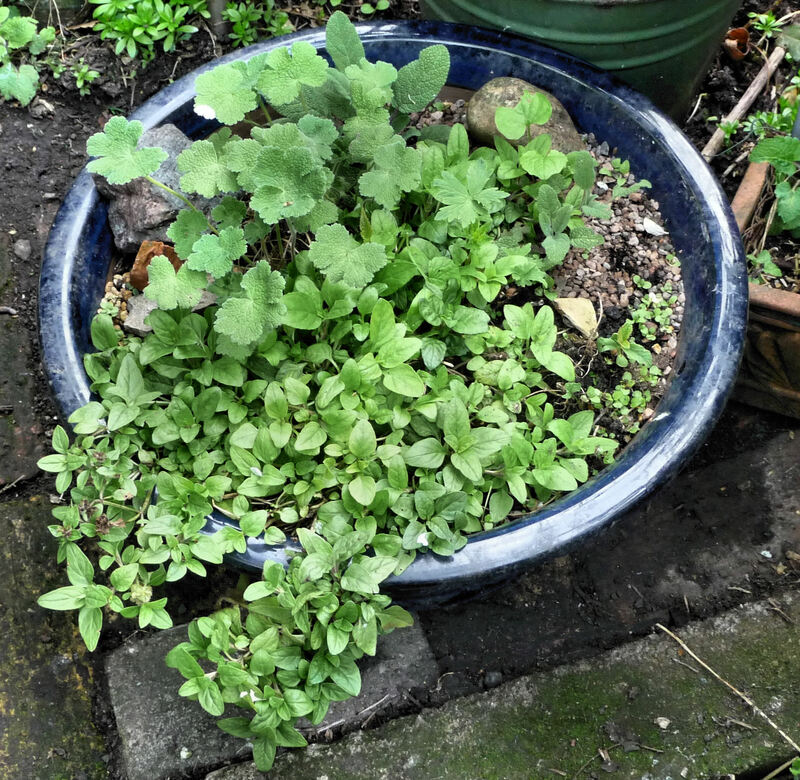 “When the plant begins to look ragged, typically after a couple of months, it’s possible to chop it back hard.